Scarcity Mentality and Body Image: Is There a Connection? - Compared to Who? Scarcity Mentality and Body Image: Is There a Connection? Do you have a Scarcity Mentality? Could it be affecting your body image? Interesting thoughts here on scarcity mentality and body image. My first year of college I internally made the decision not to pursue a career in broadcast journalism. Why? Because too many people in my freshman communications course held the same ambition. If we all wanted the same thing, there would be no room for me. I quickly added a second major and decided maybe politics or marketing would be a better fit. Less competition. Yes, I said the “C” word. I’m not sure how or why my thinking always revolved around competition, but it used to. Always. Sometimes it still does. I like to win. I prefer situations where I know I can win. If I assess the climate as a place where I’ll never succeed, I move on. This thinking almost ended my writing career–before it even got started! These thoughts persuaded me, almost daily, to just give up. But then I read something about the Scarcity Mentality. I knew the concept from reading Stephen Covey’s, “The 7 Habits of Highly Effective People” a decade (or more) ago. But, I didn’t think it could apply to my writing. 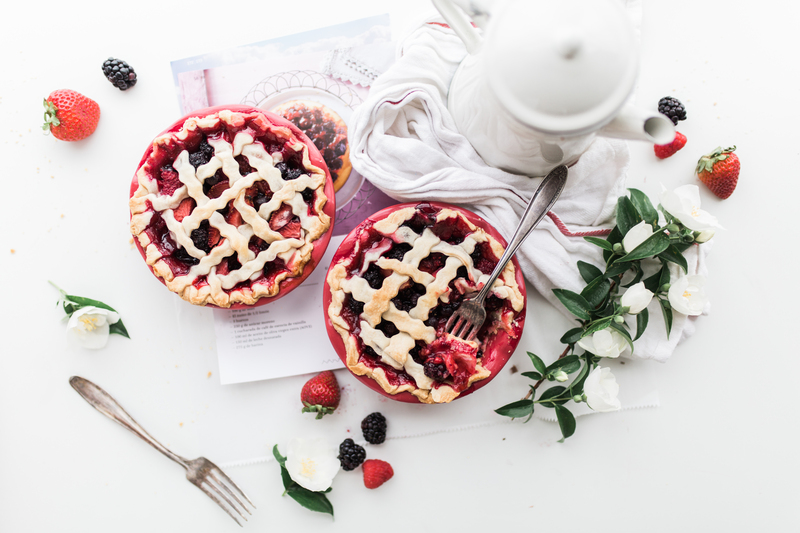 The scarcity mentality revolves around the concept that there’s only so much “pie” out there. There are only so many “slices” so if someone else gets one, you are out of luck. It emphasizes that there’s a limit to everything and if you don’t compete well, you won’t make the cut. I knew this was a problem for me. As I continued to constantly compare myself to other writers, I felt like they were getting “all” of the book contracts. I felt like they were getting “all” of the readers. Or, I felt like they were filling “all” of the speaking spots for Christian women. But, the truth is, God has given us each a voice. Even if two women have the exact same message, they’ll still say in in a different way based on their own experiences, background and story. In other words, there’s enough pie for everyone. When it comes to body image, I also held the scarcity mentality. Somehow, twisted in my mind I believed that there was only room for one “type” of beautiful woman. I heard people speak of beauty in other cultures, or different styles of beauty, but those concepts never resonated. There was only one type that I recognized. It was the type you most commonly see on TV or in magazines. Stick thin. Gorgeous hair. Flawless skin. Curves in all the right places. In my Body Image Scarcity Mentality, I didn’t think there was room for me to be considered beautiful unless I could meet that criteria. I didn’t believe that this world had enough space in it to accept more than one definition of beauty. So, I made it my idol and secretly committed to the pursuit of attaining the standard of beauty my culture told me was best. Opposite of the Scarcity Mentality is the Abundance Mentality. Covey believes you can only develop this type of outlook if you have a strong sense of personal worth. In the Abundance Mentality, you believe that there is enough for everyone, and still some to spare! You look at the world–not through the lens of competition, working to get your slice of the limited pie–but rather through the lens of plenty. How would our struggles with comparison and body image change if we adopted the Abundance Mentality? What if we could truly believe that it’s okay for us all to be beautiful in different ways–even if they aren’t the ways the magazines tout we should be “beautiful.” Or, what if we operated from a place where we didn’t feel threatened by others’ physical beauty or attributes? What if we were truly confident in our value as God’s unique creations and as those redeemed by Jesus’ blood, and believed that God had a purpose for each of us . . .What if we believed that he gave us everything we needed, physically, to achieve that purpose? What if we believed that, through Him, we have all we need. What if we believed that, through Him, we were enough? We’d have no need to compete, no need to compare, and no need to worry that there wasn’t enough pie. In fact, we may find ourselves happy to encourage each other, build each other up, and even share some pie. Hey Heather, I definitely struggle with this in the area of beauty, although I could never put a name to it before. Scarcity Mentality is perfect. For example, let’s say we are getting ready to go to church, I take time with my hair and makeup, and I feel and look pretty nice. My husband even says “you look so pretty.” That’s great! And I know it doesn’t really work this way, but let’s say I feel like I have 200 “beauty” points in my bank. Then we get to church. Woah. There’s a younger, much more attractive woman in the parking lot. Minus 50 points from MY beauty bank! Another 25 points if she’s showing too much skin making it hard not for men to notice. We haven’t even walked in the door and I’m down to 125. We sit in a pew, and within five minutes two beautiful friends sit directly in front of my husband and I. Bam! Subtract another 50 points! Now I’m starting to feel incredibly ugly and worthless and my husband can sense it. In my twisted mind, another woman’s beauty seriously detracts from my own. I feel too ugly to be standing next to my wonderful husband. I’m already down to 75 “points” and feeling very blue. And I feel even worse because I’m worrying about this and I know I shouldn’t be worrying about this! Then the worship team comes onto the platform. The backup singer is young, and stunningly beautiful, with the gorgeous brunette hair I’d long to have – knowing my ugly blonde locks will never hold onto color that rich even if I try to dye it – and boom! Another 50 points gone. And now I feel worthless. Too ugly to be out in public. Ashamed that my husband has to even act like he knows me. He deserves so much better. I don’t know why I think this way. I know, logically, that its wrong. I know, spiritually, that it’s wrong. But it’s like I cannot help it and it just makes me feel so very, very worthless and repulsive. Other women certainly deserve to own their beauty. I just wish it didn’t have to make me feel so ugly. Especially when I felt good when we left the house. It’s all very sad. Thanks for the post! It makes a LOT of sense to me. Ha. Rhis was lovely. However, when I first read the title re: scarcity mentality, I was thinking of my own experience of being homeless & hungry ans how that affected how I eat (must finish every crumb because you don’t know when you might get food again…). But the same thoughts apply. When I prayed my gratefulness for food and trusted in God for the next bite, next meal, it was always there, even if I was hungry for a little bit between. We have on our side a God of abundance. Our plates are full & our cup run over, even when we face true scarcity. God provides, especially when we surrender and trust the outcome to him. Beautiful, beautiful testimony of abundance! You are so right! God provides! Thanks for sharing that Rebecca!